Jackson Harlan, a 6’ 5” senior point guard, was named to the Lexington Herald Leader First Team All-State Basketball Team. It is believed to be the first time a Clinton County High School boys’ player has made the “First Team” listing. Harlan averaged 23.9 points per game for his senior year of action, leading this Bulldog squad to a 24-8 overall record. Harlan has signed to take his game to the next level with the Western Kentucky University Hilltoppers in Bowling Green. 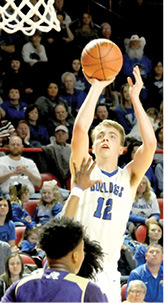 The year ended for the Bulldogs in the semi-final round of the 4th Region Tournament when they lost to Bowling Green High School. Head Coach Todd Messer told the Clinton County News that coaching Harlan for the past few years has been a fantastic experience. The head coach also noted that Harlan’s achievement of being named to the First Team All-State squad was an honor that was well deserved for his senior point guard. Messer also noted that, like most basketball fans in Clinton County, he is looking forward to following Harlan’s career as he dons the red and white WKU Hilltopper uniform. “His success is something that our program and community can celebrate and I look forward to following his career and development at WKU,” Messer concluded. All-State selections are named by the state’s two largest daily newspapers, the Lexington Herald – Leader and the Louisville Courier Journal. The Courier Journal normally names it’s All State Basketball Team selections in April. Although it is believed that Harlan is the first boys’ varsity player to be named to the “First Team” rank when All-State teams have been announced in earlier years, there have been others who were named to the All-State teams on lower levels. Noted local historian David Cross, an Albany attorney, and Clinton County News Publisher/Editor Al Gibson, combined their research efforts this week to compile at least a partial list of the former players who have been named to All-State lists in past years. Cross’ research found that the first local player to be honored with an All-State selection was John B. Smith, who played for what was then Albany High School and was named as one of the few Honorable Mention players in1946. Jim DeForest, Honorable Mention, 1959. Jack Latham, Honorable Mention, 1960. Kenneth Conner, Honorable Mention, 1961 and 1962, East – West All Stars in 1962. Jack Sewell, Honorable Mention, 1962. Wayne Ryan, Honorable Mention, 1966 and 1967. Larry Hatfield, Honorable Mention, 1971. Robbie Davis, Honorable Mention, 1981 and 1982. Bobby Storie, 2nd Team, 1982. Daniel Latham, 3rd Team, 2000 (state’s leading scorer). Justin Vitatoe, Honorable Mention, 2006, 3rd Team 2007. Keifer Dalton, Honorable Mention, 2013 and 2015. Jackson Harlan, Honorable Mention 2018, 1st Team 2019. In addition to the aforementioned players, two other figures with strong ties to Clinton County basketball have also been on All – State lists in previous years. Lindle Castle, who coached Clinton County boys’ basketball for 19 seasons (1957-1971 and 1975-1980), was a standout players when he played at Clark County High School. Castle was named to the All-State Honorable Mention squad in 1948 and to the 2nd Team squad in 1949. Allen Feldhaus, Jr., who coached Clinton County for two seasons (1986-1988), was also a standout player when he played for the Royals of Mason County. Feldhaus was named to the All-State 1st Team in 1981.